Crews spent all day Wednesday cleaning up after a water main break caused the road to crumble, almost devouring a car, in Manchester, New Hampshire. 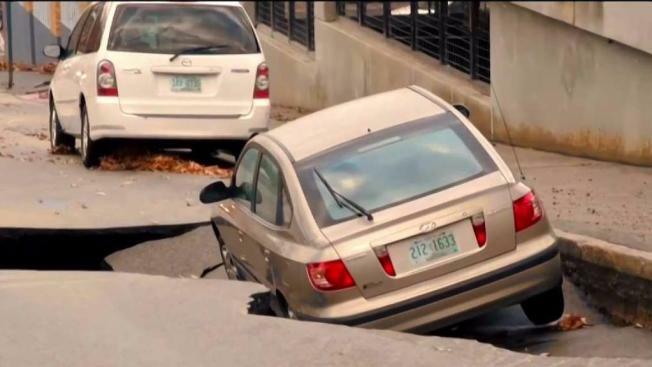 It was a tough morning for residents and drivers in Manchester, New Hampshire after a massive sinkhole almost devoured a vehicle. By dinner time Wednesday, it was quiet on Langdon Street because crews have made significant progress. At about 5 a.m., Manchester Water Works Supervisor John St. Pierre got a call. Witnesses were reporting rushing water and a car swallowed up in a sinkhole. “That was definitely the worst of the damage,” he told NBC Boston. “The pavement down the hill is buckled and compromised and it’s all going to have to be dug up and replaced." He says it’s some of the worst damage he’s ever seen from a water main break. St. Pierre says a six-inch, cast iron water main cracked. He says it’s more than a century old and when it gets cold outside and water temps drop, this is what can happen. “We’ve got about forty miles of that type of pipe in our system, we replace it in line as we can, but obviously there are budgetary constraints as well,” St. Pierre said. The car was hoisted out of the hole and crews got to work repairing more than $100,000 worth of damage. “The good part is nobody got hurt, there were no injuries, and we can fix all this,” St. Pierre said. Langdon Street is back open for Wednesday evening, but will likely be shut down Thursday when crews return to finish their work.